To answer the title question, "No." Or, at least, "Not us." It's been quite a nice surprise. Not tired, but cautiously optimistic. But I’m been wondering where’s the volatility. Are you rather being stressed for 8 years of down markets than 8 years of bull markets? I don't know about your plan but the more bull markets, the sooner I can retire. Otherwise, it seems that your only investing thing to do is post messages at bogleheads.org. Correct, investing the Boglehead way is pretty boring. I have done my annual rebalancing, the Required Minimum Distributions are set, nothing left to do. At one of the card clubs, a player came to my poker table once complaining that at his last table, he hadn't won a hand in three hours, and that he felt like it was fixed against him. One of the sharks at my table shook his head and said "If it was fixed, they would have let you won a few!" Yes, the market's remarkably steady rise up has me thinking it's fixed in some way that we don't understand, and that it's not going to end well. ...Nope that's not it, on track for my portfolio to easily increase by the largest absolute dollar amount ever this year. Just unsettled by the markets lack of volatility and amazing number of new highs. I don't think there is any "lack of volatility". A lot of people have developed towering reputations, and even won Nobel Prizes, by equating "volatility" with standard deviation of returns. Both positive and negative deviations from the mean are a part of standard deviation. We seem to be experiencing a significant positive deviation from recent mean returns, which is usually considered volatile, by the definition above, so you are right to feel nervous, but the reason is that there is significant volatility. The big question to me is whether the bull is sustainable. The previous decade has seen a CAGR of about 7.7% for the S&P 500. I don't have the numbers right in front of me, but my sense of it is that the "bull market" of 2009+ was really a period of lower than average volatility and lower than average returns. I am hopeful that current conditions are just a return to the historic mean of about 10% CAGR. There has been a lot of bandwidth consumed by speculation on a historic shift to lower returns over the past few years. What if that was nothing but a consumption of bandwidth and there really will be a reversion to the long term mean? IMHO the cost of government regulation of business is always underestimated. The current push toward less regulation may help to increase CAGR. Historically, regulation has increased over time, so previous historic return rates were achieved in lower-regulation environments. This is always tough to evaluate. You look at the returns since the beginning of the bull market and they look outsized, you pull back to 1/1/2000 and you wonder if we are just playing catch up. My biggest concern comes from the lack of concerns I hear voiced about the market recently. I am a big fan of climbing a wall of worry because that how you get the positive news/surprises that move the markets forward, remove that and the likelihood is any surprise will be negative, I am speaking in the macro here. That said I also believe all Bull and Bear markets eventually over shoot to the up or down side so optimistic valuations are just a part of a Bull market, not a sign they are ending. When was that market crash? I missed it. No 20 or 30% down turn in the market that I remember. I think he is talking about an almost exactly 10% pull back in February 2016 if I remember correctly. If I remember it was very short lived. I don't think it of a downturn as a crash until it is at least 20% or much more. But I have been in the market since 1988. I just pulled up the 10 year weekly chart of SPY on Scottrade. Hit a high of $136.57 on April 25, 2011 and a low of $107.43 on October 3, 2011. Greater than 20% drop. High on May 18, 2015 of $213.78 to low of $181.02 on January 18, 2016. Greater than 15% drop. There have been zero drops of 20% or more. I didn't check but my guess is you used intraday numbers to get a drop of over 20%. I would think if one is stressed while the market is going up then one would be more stressed when the market is going down or the market is flucuating or if the market has flatlined. Just remember that we are in for the long haul and that STRESSED spelled backwards is DESSERTS. As someone who is in their peak earning years continuing to make significant contributions to their portfolio, I think I would prefer to have the market going down or flat lined. And with retirement coming sometime in the 36ish months, I think I would prefer to retire during a Bear market not have one occur early in my retirement. I couldn't care less. I'm going to invest the same amount every week regardless of market activities. Plus, I'm "only" 36, so I know I have a long, long time to go. Yes, younger folks making regular contributions to their 401k or similar retirement plans should pray for a prolonged down market. Remember, the only two prices that really matter are the price you pay the day you buy and the price you get on the day you sell. Everything in between is merely "noise. So continue to make your contributions when the market tanks, knowing that over the longer term, you're buying at "sale" prices. On the other hand, retirees and those close to retirement don't really want to see a prolonged down market that just might spoil their retirement plans, so they need to make sure their asset allocation can handle a 50% drop without causing panic selling. Don't worry, I just moved a good chunk of my monthly contributions into the market on Friday. The market is due to drop next week due to this. It is better to see the 50% drop before retirement, especially for those who are doing one more years. If the 50% drop comes one year before retirement, and you haven't allowed for that possibility with your asset allocation, perhaps you'll have to work additional years before retiring. Yes. That is the point. We would be sure we don't have enough and would be happy we didn't retire. It’s easy to avoid fretting over the markets. Set up the LifeStrategy fund of your choice, start automatic contributions from your checking account, and then forget about the stock or bond markets or that you have money in them. In other words, focus on anything but equity markets and investing. I did use intraday prices. why would I not use intraday prices? what makes the last transaction of the day any more or less important than any other transaction that day? from the highest transaction to the lowest transaction for the same exact security, there was a drop in excess of 20% and another in excess of 15%. That's really all there is to it. I'm not trying to draw any conclusions from it other than that it did in fact happen. I’ve had a somewhat similar reaction to the market’s rise. My stocks have more than doubled, and they’ve risen above the upper limit of my target bands. I’ve stopped adding to them, and normally I would rebalance by exchanging from stocks into bonds. But all of my stocks are in taxable accounts, and selling them would trigger hefty capital gains taxes. So I decided to change the way I look at my stocks. My domestic stocks are paying about two percent, and my foreign stocks are paying about three percent. In a time of low interest rates, those are bond-like returns. I don’t think of my stocks as bonds, but I decided to think of them more as a source of income than as a source of capital. If I need to raise capital, I can sell bonds. This works for me because I’m retired, my pension covers my basic living expenses, and I have enough in bonds to see me through to the end of my days. Now that I’ve changed the way I look at my stocks, I don’t bother to keep tabs on how the market is doing. If it goes up, that’s nice. If it goes down, I’ll be fine. Closing prices is what I have always seen used and helps to exclude flash crashes. The chart is from Dr. Ed Yardeni. Since the prior bear market ended in March 2009, this advance in equities is now the second-oldest on record without at least a 20 percent drop in the S&P 500. At 8½ years since the prior bear market ended in March 2009, this advance in equities is now the second oldest on record without at least a 20 percent drop in the S&P 500. In an opinion piece, Barry Ritholtz argues your perspective. Regardless, from May to October 2011, the Standard & Poor's 500 Index fell 21.6 percent. Some folks like to point out that based on closing prices rather than intraday moves, it only fell 19.4 percent, so by that yardstick a bear market never registered. 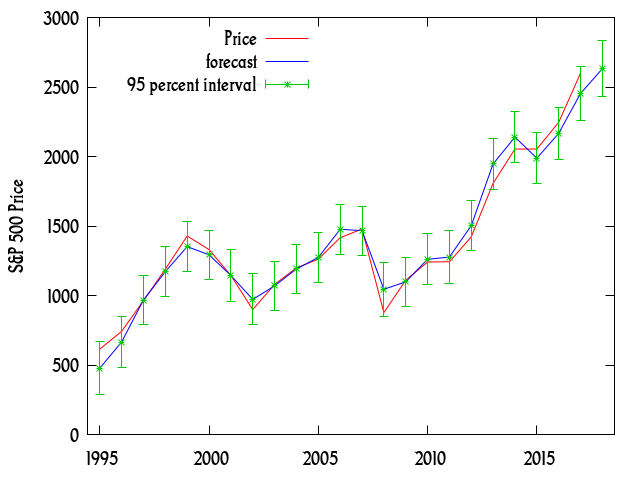 This raises our second question: if 20 percent is the magic number, why measure the decline based on closing prices? It seems as if the only reason to do so is to avoid tagging that decline with the magic 20 percent number. Last edited by TheTimeLord on Sat Nov 25, 2017 2:52 pm, edited 3 times in total. Does it really matter if it is 20% or 19.5% or 19%? Maybe it does not fit a specific colloquially accepted nomenclature, but there in fact was a significant drop in the market. I think we as humans only remember the recent and sometimes forget some of the ride. I completely forgot that 19ish percent drop. All I see is when I log into Vanguard that number is much higher as compared to 365 day sago. That is good. In my ideal world I would prefer a recession a year or two before I retire and not shortly after. Luckily I have a plan if the later happens and I'm pretty confident we will be just fine. Does it really matter if it is 20% or 19.5% or 19%? Not to me, the event was 61 months ago. Interestingly if it was a Bear market then we have had 5 since the year 2000. Not me. Bad things happen when the market goes down. Companies restructure, people get laid off, benefits get cut. This guy prefers a nice steady increase in the stock market. I don't see that I've had especially inspiring returns since 2000. Volatility yes, inspiring returns, no. Well, bonds have done okay until very recently; stocks not so much. I hope this is just the beginning of end of the bear market that began in 2000. If some bogleheads are seeing something different I expect they have either been adding to equity positions during the period or have at least not been drawing down equities throughout the period. shouldnt everyone's concerns already be factored into the market? The market reflects current state supply/demand equilibrium by its very nature..
"Tired" of the stock market going up would not be a good way to put it, but yes, I do sometimes wish we would just get the correction over with. When we had the big downturn ten years ago, people would ask me if I was worried. "No, I want it to go damn near zero! I'm still buying! Why would I prefer to buy with it going up? Let it go up later!" Well, now it's later, and I'm not buying any more, except for the cash I have not fully reinvested yet. Doesn't matter though. I would still rather have a small crash now than a big crash later. LOL. This has clearly been bothering you. First thing is first. You're dying of boredom but you've ultimately certainly seen your portfolio balance increase significantly. If that's indeed the case, then you probably don't need to take the same risk as earlier. From your previously posts, you're no longer a spring chicken so perhaps you don't need that same allocation to equities that you did a couple of years ago. Why not reduce your exposure to stocks--not because of market timing forces but because you don't need to take that risk anymore. Things have changed and your asset allocation might be ripe for a change as well. Second, if you're feeling generous during the holiday season, start researching where you can transfer those appreciated shares of VTI. Same here. Burn baby burn!. Been thinking of making a new post lately, I DCA quite a bit- 4x a month, once each time I get paid, but my bank account still continues to grow slowly and I keep thinking I can keep things as they are and then whenever the market crashes, dump it all in then. But then I'm market timing and I guess theoretically I'm better off dumping it in now, but my brain cant grasp the fact that if I go in now at say 100 bucks a share of whatever, and it goes to 110 over the next couple years, and then the market shits the bed and it goes down to 90, am I not better off buying at 90?? I may be the only person in the world that feels this way but I need to express this emotion. I am just tired (maybe even exhausted by) of the stock market going up. I am in mild agreement. It feels unearned. BUT, if you step back and look at a long-term log graph, it's really not that crazy. You just have to remind yourself of it. Something I've noticed in my own portfolio is that if I'm over-stressing on a particular component, it's possible/likely that I had made some biased decisions about that component, and maybe I should reflect on that. You should ALWAYS be worried about SOME component of your portfolio, if you constructed it properly! But if the worry is excessive, it may be that you should shift 5% from that component to some other component which worries you less, or which worries you in a different way (diversification). A couple of my fellow retirees have been taking some cash out of overfunded 529s this year. Despite the withdrawals the value of the 529s are higher than they were on January 1st. I don't know what is going to happen to the market, but it feels good to see portfolios grow despite withdrawing funds in retirement. I expect a correction at some point, but am not worried about it. I am inoculated against a poor sequence of returns by having various income streams. The rising market has made my Roth conversion strategy better than I had planned on as the last conversion was in 2015. I like this observation. Yes, it feels unearned. Like we’re experiencing a lucky streak—one that could be broken at any time. Then, there is an anchoring effect: to the higher numbers in our portfolios. When the market eventually reverses, it will feel like we’re losing our lottery winnings/life savings... even if the bottom is significantly higher than the number to which we had previously grown attached. But the gains and losses are both illusory, a product of our need to keep score. However irrational, we can’t ignore our emotions. We should take measures to ameliorate the effects. One way I’ve done this was to create a mini-spreadsheet graphic that reflects my portfolio balance minus a 55% drop in equities... it’s automatically updated and I can change the 55% to some other value if I want. It’s just so I can be mentally prepared for a stock market crash. Another more obvious way to get a handle on this problem is to adjust one’s asset allocation to preserve some assets (as Taylor Larimore would phrase it: “the amount I can’t afford to lose.”) I did this, too. tired isn't the word that does it for me - it is the anxiety that I experienced as a boy with the slow steep climb of the roll-a-coaster. While others seemed to enjoy the slow climb -- I dreaded the steep decline that follows. While others screamed with glee, I screamed with fear. While I feel comfort at the new heights of my conservative portfolio, I know I have assumed a base level of assets that is very subject to a major adjustment. I find myself toying with possible expenditures i.e. selling my house and moving into a retirement community. I would be putting out a lot more money initially and on an ongoing basis. I feel I could easily swing it now -- but how would I do after a major market decline and a prolonged recovery? The answer is most likely fine but it does play with my mind. It is one thing to know a 20% "correction" (or more) can occur intellectually, it is another to watch wealth decline - especially in retirement- especially if you have added expenses. It becomes more of a mind game than a math or money game. I use a 40% drop in my spreadsheet as my crash factor. I think using this factor where I have a handle on how much is at risk by being in equities is the reason that I now focus far more on the absolute dollar amounts of my portfolio than the percentages in an AA. Calculating I have X dollars at risk by being in equities is more concrete to me than calculating I have Y percent at at risk. For 2018 the 500 looks good in the 2600's with $115 for EPS estimate. Wow you guy/gals are scaring me. I know squat about investing and only have some exposure through my employers 401k and some invested through Edward Jones. I joined this forum just yesterday to learn more about investing and making more educated decisions. I don't need the stress. Maybe ignorance is bliss. I also use EJ and you need to be ready to hear every bad thing that can be thrown EJ's way. This discussion group is all about Vanguard. So take what is said about EJ with a grain of salt. Investors would be better served doing research to verify/disprove for themselves what is said about EJ here rather than "take [it] with a grain of salt." No argument about doing your research and making your own decision. All I am saying is look at the whole picture not just focus on one aspect. There is Vanguard that has no brick and mortar building and every time you call you get someone different. There are two ways to look at investment firms, very YOYO (you're on your own) or as much hand holding as you want/need. I prefer having a steady person with a consistent view rather than a voice on an 800 number. But that is just me. EJ is not the devil incarnate that some here make it out to be, and Vanguard is not the be all end all either. Both have strengths and weaknesses. May be not tired, but unusual lack of volatility is bit alarming - don't know what event will break this calm. The researchers created two investing scenarios. In one, the risk-free rate of return from investing for one year is 5%, and the expected rate of return from a risky asset (such as stocks) is 10%. In the other, the risk-free rate is 1% and the expected return on the risky asset is 6%. In both scenarios, $100 invested in the risky asset has an expected return of $5 over the risk-free rate. An investor should be agnostic about how much money gets allocated to risky assets in either case. Over the past several years, during which central bankers have driven down rates, investors steadily took on more risk—just as the bankers wanted. This research suggests it may have been excessive. If rates go up and investors go back to less risky portfolios, assets such as stocks could be in for a big drop. ... I guess theoretically I'm better off dumping it in now, but my brain cant grasp the fact that if I go in now at say 100 bucks a share of whatever, and it goes to 110 over the next couple years, and then the market ***** the bed and it goes down to 90, am I not better off buying at 90?? You are only better off IF it comes back to 90 AND you decide to buy there. My experience has been that I am more likely to miss opportunities by procrastination than to be able to time the market correctly. I certainly would not be agnostic in the scenarios described. To show why, consider in some detail the extremes in the graph. At -1%, 4% the ratio of returns from a risky investment to a risk-free one is (1.04/.99) = 1.051, whereas at 15%, 20% this ratio is (1.20/1.15) = 1.043. I would say that the risk premium in the first case was 5.1%, but it was only 4.3% in the second case. 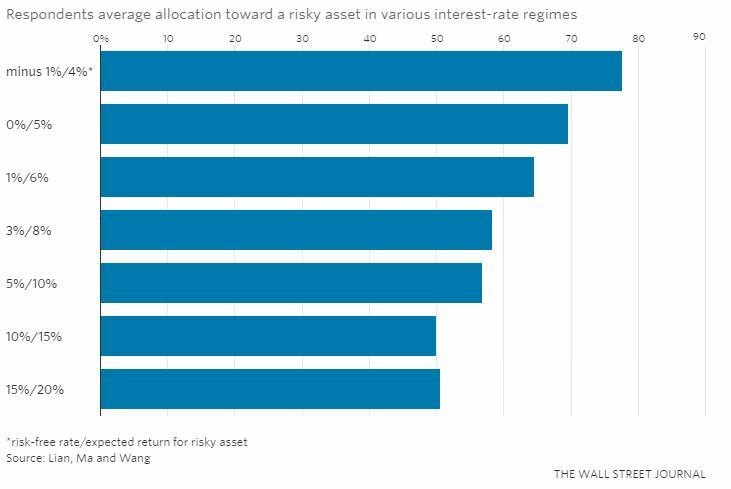 Of course the portfolio allocation to risky assets would be higher at a premium of 5.1% vs. 4.3%. Full disclosure: I was a student at MIT 50 years ago, and actually graduated. What I knew about investing at the age of 21 would not have filled a thimble. I suspect that these students are in about the same position. Just to cover all the bases, my brother was at Harvard at that same time, and his investing knowledge was about the same as mine. I once read the WSJ frequently, but have subscribed to Investor's Business Daily for over a decade. Last edited by CurlyDave on Sun Nov 26, 2017 11:29 pm, edited 1 time in total. So you would rather be the 1989 japanese investor (prolonged down market) or the US investor since 1989 (pretty bullish)? :) A lot of stock market bear markets don't result in super compsenation later. They are a result of slow growth and lost productivity that never comes back. PE compression gives you some of gains that might come back but you it might also turn out that those expanded PE's never come back. In the end it isn't worth worrying about. You get what you get. The thing is nobody knows anything. Maybe we are in the middle of a 1982-1999 bull market where the best years are yet to come. Maybe we are at the 1999 level and we are about to hit one of the worst decades ever. Who knows. Instead we debate if there a meaningful difference between 20% intradtay or 19% open to close as far as when we need to start our clock:) Maybe Europe&EM take off and carry our bull market another half dozen years. Maybe we get some asian crisis and the global economy crash. Whatever happens, someone will talk about how they predicated it and it was obvious. You've been told things that you dismiss without really considering them. I have family that works at Jones, but I wouldn't use them for any reason. This is not a Vanguard forum, although their products are very popular. However many like me keep their investments at other custodians. So you can have the great low-cost investments and still have an investment firm with a local presence if that's what you want. You don't have to pay the ridiculous costs at a Jones or other full service outfit. No, not tired in the least. The more the market goes up, the more of a correction it would take to break even. Based on today's market action this thread deserves a bump. I just posted in the "what are you up YTD" thread. And already its out of date. Yes, the crash and bear market from June-ish 2015 to February 2016. This points to another issue: relying on one index, even the S&P 500, isn't necessarily the best measure of bear markets. i am absolutely loving this. if we stay flat for the rest of the year, my portfolio IRR will be over 20%. that is a good year. You need to post daily nowadays.